This picture of The Ballycrovane Ogham Stone - or "Béal A'Chorraigh Bháin" - was taken by Vivienne, who also took the photos of The Longstone, Mottistone, and Derreenataggart stone circle that I posted on A Bad Witch's Blog last week. Ogham stones are megaliths inscribed with Ogham - an Early Medieval alphabet used to write the Old Irish language. There are about 400 such standing stones in Ireland and western Britain. 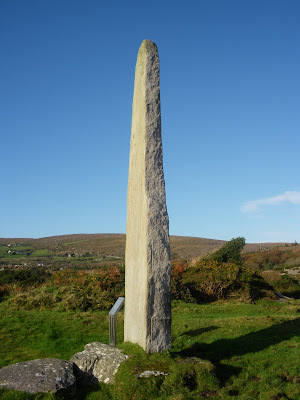 The Ogham stone at Ballycrovane, County Cork, is the tallest at 17ft (5.3m). The Ogham writing on The Ballycrovane Ogham Stone is worn and could have been inscribed long after the stone was put in place. Some of the carving is awkward and slanting, suggesting the runes were carved in it while the stone was erect. The Ogham text reads: "MAQI-DECCEDDAS AVI TURANIAS", which has been translated as "Of the son of Deich descendant of Torainn". Vivienne, thanks very much for sending in such fascinating photos!